This is a big bite of southern cuisine with a southwestern flair. Black Eyed Pea Mash on Crispy Polenta is a great appetizer to serve for any event and is packed with the flavor that brings folks back to the table looking for seconds. This appetizer is a perfect good luck charm for any New Years table with all the requirements of the good luck peas . Not only can this flavorful mash be presented on a crispy polenta round, but can be used as a wonderful dip served with corn chips. I sure hope that you enjoy this new recipe that I developed for special parties. In a hot skillet cook the bacon until crisp. Remove the bacon and drain it on a paper towel. Reserve the fat that is rendered from the bacon. Slice the cold polenta round in 1/2 inch slices. Place the polenta rounds on to a baking sheet. Brush both sides of the polenta round with the bacon fat. Bake the polenta round at 350 degrees for 20 minutes. Then turn the polenta rounds and cook at 450 degrees another 10 to 15 minutes until golden brown on top. Remove the baking sheet and let the rounds cool to room temperature. Drain the black eyed peas and place into a food processor. Process the peas for just about 3 rounds just enough to break the peas up but not puree, you want some nice chunks of the peas in the mash. Place the pea mash into a mixing bowl. Chop the bacon in very small pieces, reserving 1/4 of the bacon pieces for the top garnish. Add 3/4 of the bacon pieces, garlic, onions, jalapenos cumin, salt, pepper, cayenne, and lime juice to the mash and mix well. Let chill in the refrigerator for 30 minutes before serving. After the pea mash has chilled scoop 1 tablespoon of the mash to the top of the crispy polenta round and garnish with green onion top and bacon pieces. For the Blacked Eye Pea Mash Dip, after the mash has chilled serve with corn chips and garnish with green onion tops and bacon pieces. It Will Be A Hit Of The Party! I loved having you stop by to enjoy these Black Eyed Pea appetizers with us today. Hope you have a fantastic week and come back to see us real soon! Thanks so much Adrian and Happy New Year! Yum, Helen. These are one of the best comfort foods I've seen in a while. I cannot eat these but they sure look CUTE !! Miz Helen - These look delicious! So clever to use polenta rounds instead of crackers. I'd especially like that because it could so easily be gluten-free, too. Black eyed peas have such a great flavor for these seasonings, too. I am going to have to make sure that a friend of mine sees this one! She loves polenta! 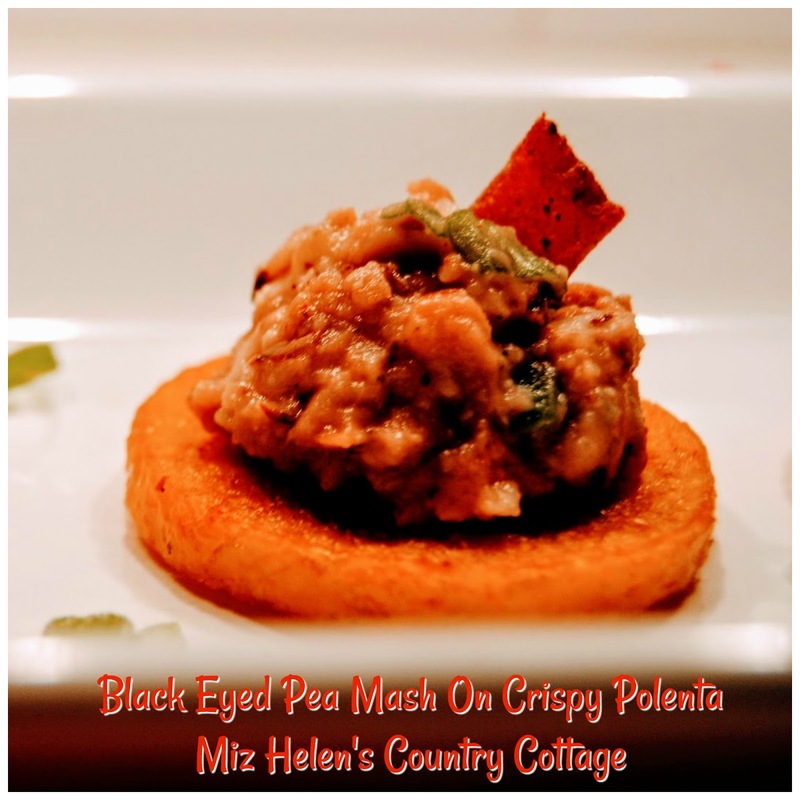 I've never done much with black eyed peas, but this sounds delightful, especially served on the polenta. These sound delicious! I have never cooked polenta, but it looks delicious…and you can't go wrong with the black eyed peas for sure! Happy New Year! Hi, Miz Helen. This is a fun and different way to serve those black eye peas for New Year's. Thank you for sharing with See Ya in the Gumbo this week. I hope your new year is off to a great start!